Home » Website Building » Weebly » Weebly Promote Email Marketing – Good or Bad? Weebly Promote Email Marketing – Good or Bad? Weebly introduced a new email marketing service called “Weebly Promote” and offering it as a separate premium service for all existing plan users. You might have noticed a new “Newsletter” element was added in Weebly site builder for this purpose. Let us explore what is Weebly promote, how to send out emails and comparing it with a popular MailChimp service. Weebly promote is an integrated email marketing service using SendGrid API and Weebly users can send out emails to their subscribers with Weebly promote. This is being offered as a separate paid service and NOT included in any of the existing plans. You need to create a mailing list on Weebly platform, design email and send to the needed groups. At this moment Weebly offers a free trial of creating 2 email campaigns for all users. How to Use Weebly Promote? All existing Weebly users will have access to Weebly promote which can be accessed with the URL “https://promote.weebly.com”. The first step before building an email campaign is to add subscriber lists. Click on the “Contact” option and choose one of the available options. Add Individual – manually add individual subscriber. Copy & Paste Email Addresses – copy and paste email addresses with comma separated values. Import from a file – manually create a CSV file in the following format and upload on Weebly to create a mailing list. 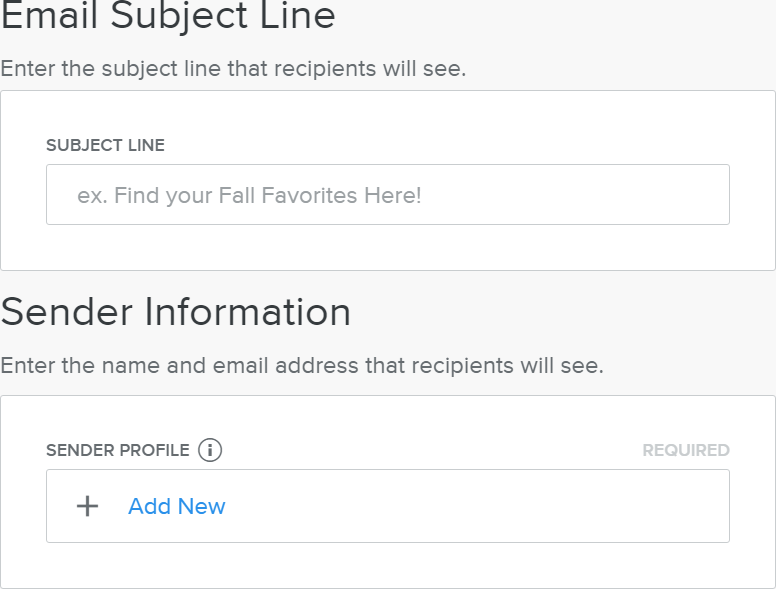 You can group subscribers into different groups and send the email to any specific group. Weebly does not offer any ways to import mailing lists from existing services like MailChimp or Constant Contact. Once a mailing list is created, click on the “Compose” button and follow the step by process to create an email campaign and send to the required user groups. 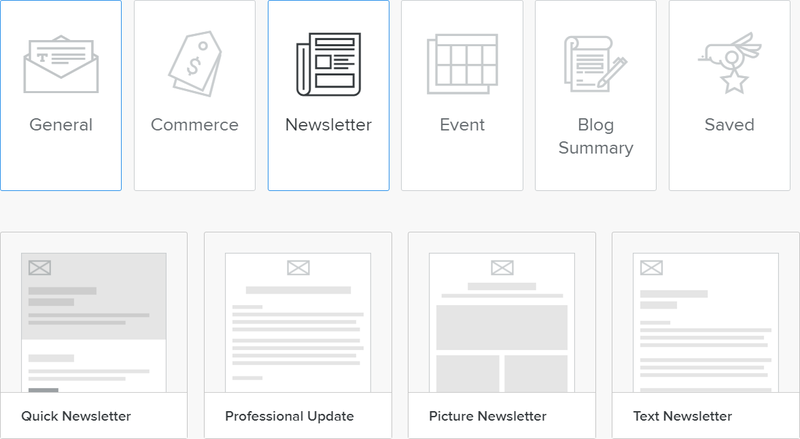 Weebly offers categories like General, Commerce, Newsletter, Event, Blog Summary and Saved. 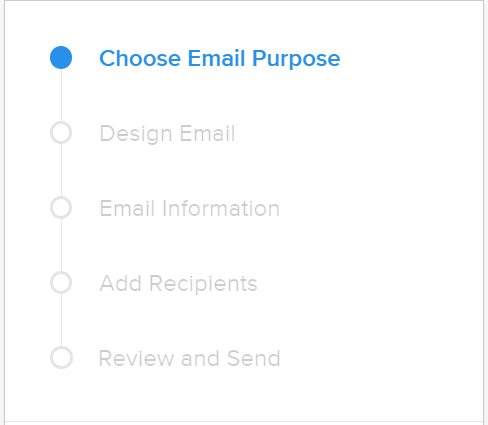 Select one of the categories and choose the template for the email to continue to the next step. 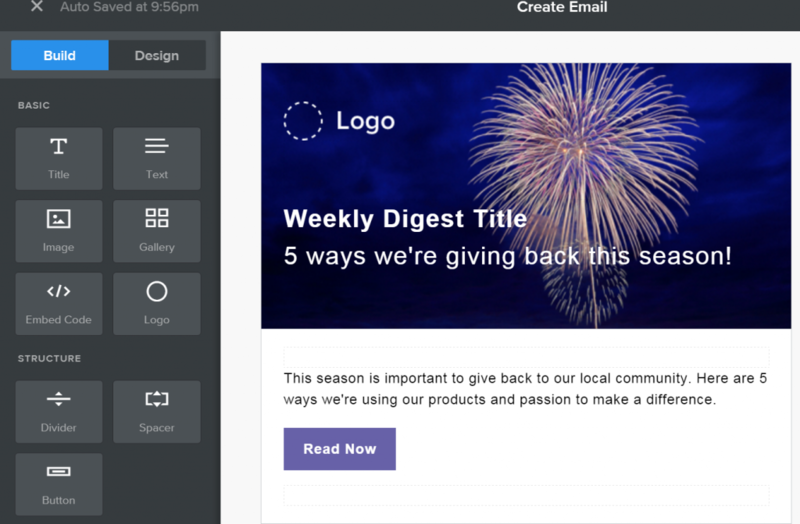 An email builder similar to Weebly site builder will open with drag and drop elements. There are elements under “Builder” tab like logo, social icons, button, etc. which can be dropped on the form and customized as you need. More options like changing fonts, border and colors are available under “Design” tab. Next step is to add details of the sender (generally your details) and subject line for the email. Add emails from existing groups. Import from CSV file as explained above in the creating a mailing list section. The final step is to review the email and send to recipients. You can send a testing email to check the connectivity and the look of your email also there is an option to schedule the email to be sent on predefined time. Once an email is sent to the subscribers, the performance of the campaign can be monitored under “Sent” tab. It will show you the open and click rate percentages indicating how many people opened your email and how many people clicked the links in the email. We do not allow the use of third party mailing lists in our system. If you bought a list or borrowed a list or another company gave you their list to use, these are all against our Terms of Service (https://promote.weebly.com/terms-of-service) and can lead to the immediate termination of your account. Any list you upload to our service must be a list of opt-in subscribers and/or your customers (or the customers of a company on whose behalf you’re sending the messages), no one else. Counterfeit or “knock off” products appearing to be another brand. The problem with Weebly is adding new feature as a separate paid service while having different premium plans on the card. Even a business user needs to pay at least $8 per month to the lowest build plan of Weebly promote. This is costly option compared to the free services like MailChimp who offers considerably more features for less price. MailChimp offers a free plan with a limit of 2,000 subscribers and 12,000 emails per month. You can also choose to use “pay as you go” mode when the limit is reached out. Also MailChimp offers exhaustive reporting with lot of metrics like social performance, geographical performance, top links clicked, last 24 hour performance, etc. Below is the simple comparison the Weebly promote “Build” plan and MailChimp “Starting Up” plan. 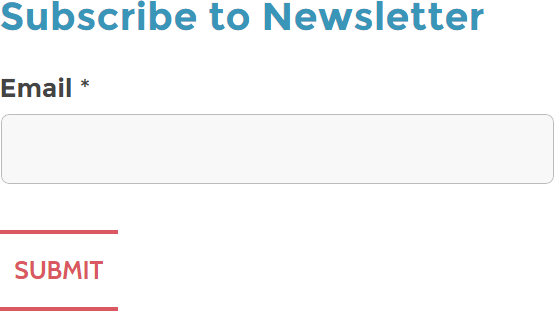 It is mandatory to include the MailChimp logo in the newsletter for free users. 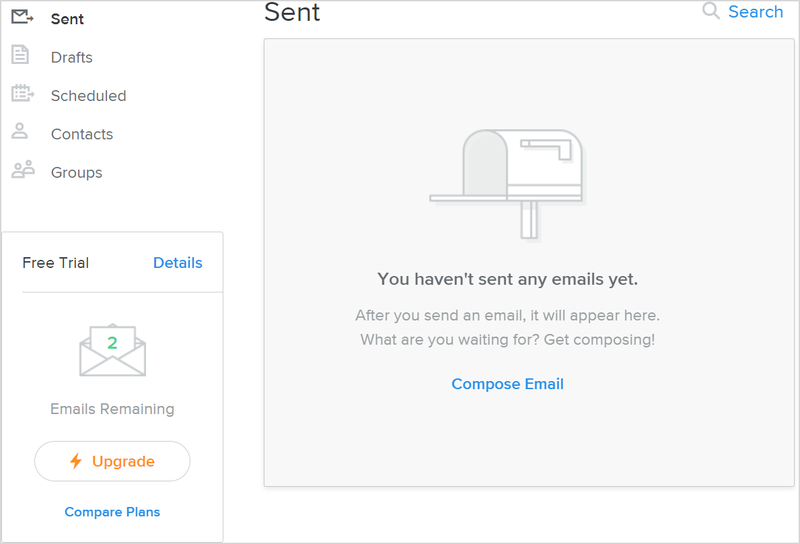 By looking at Weebly promote, we can conclude Weebly as usual comes up very late with an old email marketing feature without much appealing to both premium as well as free users. A business plan user will end up in paying $33 minimum ($25 for business plan + $8 for Weebly promote build plan) for using a Newsletter function which is very costly in our opinion. Again features of the build plan costing $8 per month are not comparable to the free plan offered by MailChimp and other providers. Since the process of creating campaigns and sending emails remains unchanged with Weebly promote and third parties like MailChimp, we really do not see any great value will be added using Weebly promote. On other hand, Weebly promote is suitable for those looking for an integrated email marketing solution with the customer and contact form details from their Weebly site. Does Weebly not integrate their email tool with their web tool? I think the biggest factor to use Weebly Promote is that essentially, it is an email marketing tool with a microsite feature. More than microsite in fact. MailChimp has no microsite or even landing page capability so this would seem to be a differentiator. Here’s my issue; anyone know the fix?? We have not been able to send our emails for TWO WEEKSand are getting frustrated. Anyone had this issue and found a fix? How do we get a phone call from Weebly or call them?